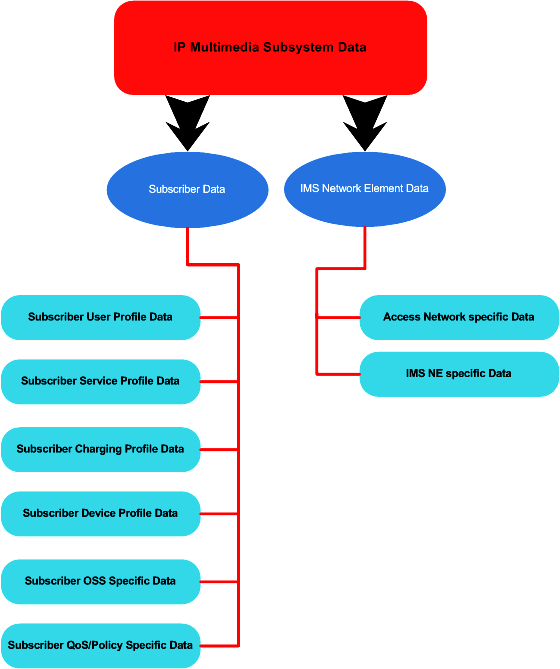 IMS and LTE Policy Control for devices of different form-factors. 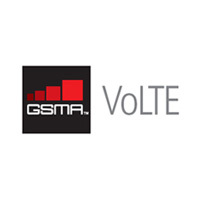 With the advent of LTE and IMS, Voice and Video over LTE (VoLTE) is fast becoming a reality. Customers are turning to video services rapidly and data consumption is increasing exponentially. Moreover, with multi-screen devices such as smart phones, tablets etc being churned out in millions – customers now own atleast 2 smart devices today. Customers also expect their applications to provide them with a uniform customer experience irrespective of the device form factor. This holds true for all applications, and it will also be a natural expectation from IMS and VoLTE applications. In contrast to OTT (Over the Top) internet traffic and OTT video applications, IMS video applications have a slight edge of policy control and enforcement. As the form factor of the device increases (from a smart phone to a tablet for example), its data consumption requirements also increase due to the bigger screen size. Moreover, if the customer chooses to play HD content, the throughput requirements would further increase accordingly. Hence, in order to preserve the customer experience of video applications on multiple screens, it is also important that a sufficient data pipe is provided to the application in order for it to perform uniformly. In addition to the data pipe, video playback latency and jitter control also need to be controlled over the air. This becomes increasingly important, if we wish to deliver Live TV services and VoD services over IMS. To mitigate this situation for IMS video applications, we can effectively use the IMS and LTE policy control framework. The solution uses one of the most ‘ancient’ SIP headers defined by RFC 3261 in conjunction with the DIAMETER Rx interface. The User-Agent header is defined in Section 20.41 of RFC 3261, and this header is used to provide ‘information’ on the user agent originating the SIP request. This header can be used by IMS User Equipment to provide details on the form factor of the device where the IMS client is executing. Moreover, it should also be possible to provide device pixel details (if available from the OS). The P-CSCF in the IMS core network can extract the User-Agent header and use the device form factor details on the Rx interface. Based on the device form factor and resolution, the PCRF can enforce appropriate QCIs, UL Bandwidth and DL bandwidth for the specific device in question. In addition, the P-CSCF also sends the codec information as received in the SDP (Session Description Protocol) to the PCRF. This information coupled with the device form factor and resolution can enable the PCRF to calculate a very accurate measure of the UL and DL bandwidth to enforce. Moreover, this information can also help the LTE network to provide bandwidth boost to premium customers or premium video content. Policy control is a distinctive edge that the VoLTE architecture provides over traditional OTT video content. The ability of the LTE and the IMS network to accurately calibrate session QoS characteristics is a true differentiator as opposed to best effort video. By leveraging age old SIP headers in conjunction with the PCRF can lead to truely differentiated customer experience. OTT video provides provide a lot of jitter control, echo cancellation and buffering techniques to enhance customer experience, especially compensating for poor RF conditions or congestion scenarios. However, none of those techniques can match the realtime QoS enabled architecture of VoLTE, which can guarantee high throughput even in low converage areas of LTE. This is because LTE radio coverage is not a decisive factor for calculating throughput for customers. Throughput depends on the number of empty resource blocks available in a given eNode-B cell. For a three sector LTE base station, there are 100 resource blocks per sector. This gives a total of 300 resource blocks per base station available for customers. Throughput is a factor of the number of free resource blocks available for a given subscriber in the LTE cell at that time. Even if the coverage is poor (cell edge conditions), it is possible to provide high throughput to the customer through the policy control architecture. Operators need to realize the power of the IMS and LTE architecture to truly exploit it and create differentiation in their services. 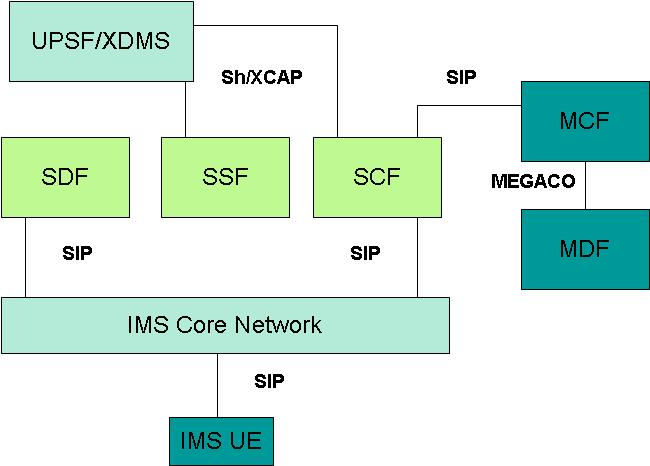 There are a lot of other hidden nuggets in the combined IMS and LTE network architecture, which I will leave for another discussion and for some other day. Hopefully, engineers from around the world will discover these hidden nuggets and construct innovative policy enabled services for consumers. 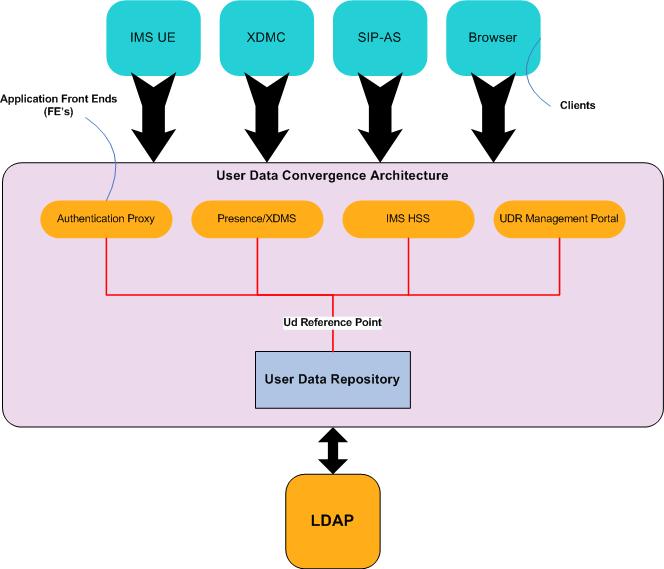 IPTV service delivery architecture over IMS and possible applications. For long, it has been envisioned that IPTV services can be delivered over the IMS core network. TISPAN has done a good job in trying to standardize an architecture for this purpose. With IMS gaining traction globally, it is a good time to review the architecture for IPTV service delivery. To successfully provide IPTV services, we need an architecture to deliver these three basic services. On top of these services, we can use IMS service enablers to enrich the user experience such as Presence and Instant Messaging (IM). Moreover, with IPTV over the IMS core we have an opportunity for providing video-interactive services for the first time. As expected, any application server providing IPTV services will reside on the IMS services layer. This means that this application server will need to support the ISC reference point. (IMS Services Control). 1. Service Discovery Function (SDF). 2. Service Selection Function (SSF). 3. Service Control Function (SCF). 4. Media Control Function (MCF). 5. Media Delivery Function (MDF). 6. 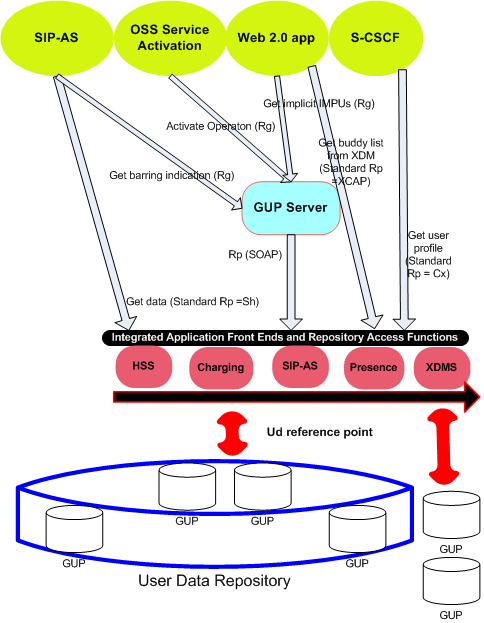 User Profile Server Function (UPSF). 7. 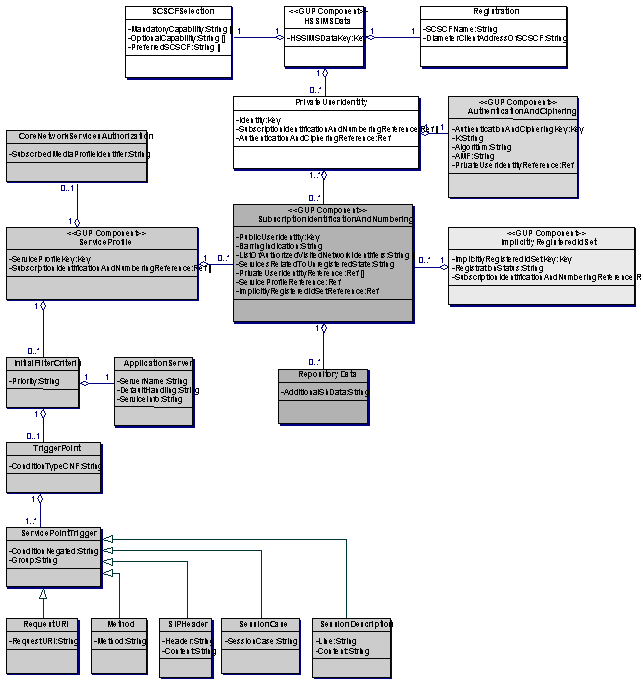 XML Document Management Server (XDMS). 1. Streaming Servers for TV channels. 2. Head Ends for VoD. 4. Content Management System (CMS). 6. Business Support Subsystem (BSS). 1. Push Mode, wherein the SDF receives the 3rd party REGISTER request from the S-CSCF and sends a MESSAGE request with the XML payload containing the attachment information. 2. Pull Mode, wherein the UE subscribes to the “ua-profile” event package and the service attachment information is sent in the XML payload of the NOTIFY request. Based on the attachment information received from the SDF, the UE contacts the Service Selection Function (SSF). The SSF provides the UE with a list of services available. This can be done by providing the UE with the electronic program guide (EPG). The Service Control Function is divided into three logical sub-functions – one for Broadcast television, another for content on demand and the third for personal video recording. 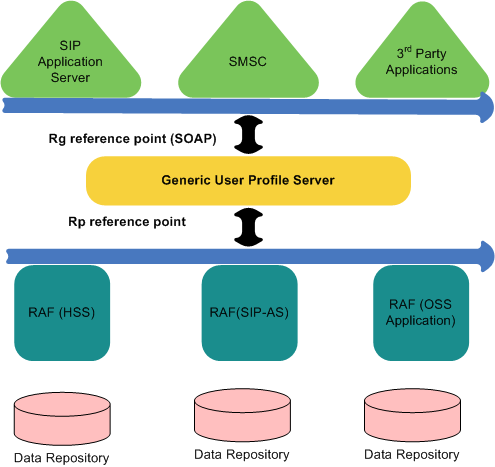 The SCF is responsible for IMS session control and acts as a SIP-AS. The SCF also generates charging information on DIAMETER protocol for charging these sessions. The SCF refers to the IPTV UE profile stored in the UPSF or in the XDMS for delivering video services. 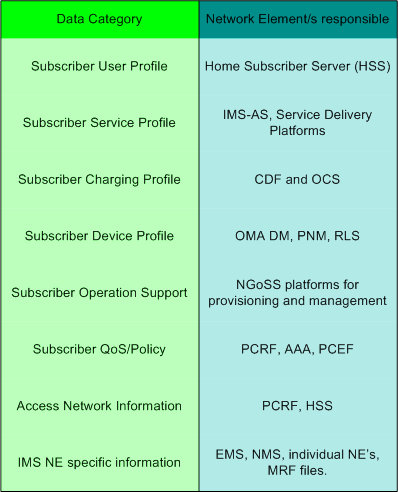 The Media Control and Delivery functions act as a split architecture similar to the IMS MRFC-P. The MCF is the control plane entity while the MDF is the data plane entity responsible for streaming video. However, in practical deployments, there are dedicated streaming servers available and Head-ends for delivering IPTV content. In addition to content, there are dedicated servers to inject advertisements in the video streams. The UPSF is the Tispan counterpart of the HSS. It stores use profile data. The SCF and the SSF can both store the IPTV user profile in the UPSF over the Sh interface. However, apart from the UPSF there is another storage alternative in the form of XDMS. The XDM operates over the XCAP/HTTP protocol. The XDMS needs to support the “org.etsi.ngn.iptv” application usage for this purpose. 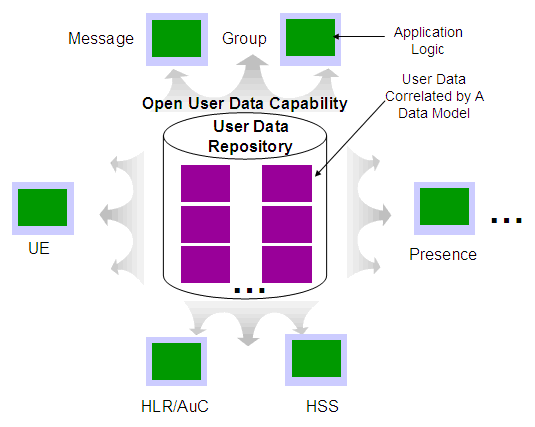 The choice of user profile between the HSS and the XDMS is implementation dependent. Traditional IPTV middleware solutions consisted of an OSS/BSS along with the functionality defined above. After standardization directions in the OSS/BSS space, and with the advent of the NGOSS architecture, there is a technology neutral approach in the OSS/BSS space. Irrespective of the line of business – IPTV, voice or video, the OSS/BSS remains common. — The realtime components have been standardized by Tispan as described in the previous section. 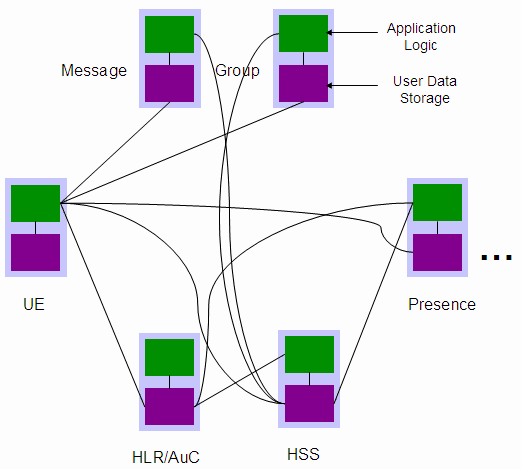 — The non-realtime components such as OSS/BSS have merged with the NGOSS architecture. OSS is required for inventory management of the STBs, provisioning of users, provisioning of IPTV services and content, service activation/deactivation and service assurance/SLA management. The Content for IPTV is stored in dedicated Content Management Systems (CMS). However, the content is provisioned from the OSS infrastructure. BSS is required to carry out traditional billing, rating, mediation and charging responsibilities for the service provider. BSS is also used for partner management for 3rd party IPTV content, executing settlements with content partners as well as generating business intelligence reports. 1. Interactive voice/video: With IMS integration, it will be made possible for integrating voice/video capabilities in IMS. For example, Celebrities can be interviewed by the media without actually needing to travel with the crew to their residence. Using IPTV, the TV studio can directly initiate a video communication with the celebrity and take their interview which can then be broadcast to millions of fans. 2. Messaging: Instant Messaging over IMS can be used as another important application for IPTV…especially amongst teenagers. Instant Messaging can also be used as an avenue for televoting in LIVE programs on TV. 3. Nomadic IPTV: As IMS is access independent, the IPTV program guide can be made nomadic. The user can access their favorite TV programs even when they are on the move and when they are roaming. 4. Video Conference: This can be a very useful application for corporates/educational institutions engaged in distance learning and training. Students can join into an educational broadcast channel or a group discussion from their homes using their IPTV set top box. 5. Video/Photo Share with Web 2.0: Users can record and upload videos from their IPTV set top boxes directly to web based applications such as YouTube. Similarly, set top boxes can also be used for uploading photos to popular services such as Flickr. 6. Security Services: Set top boxes with cameras can be used as home surveillance equipment. A series of cameras can be connected to the STB over WiFi that cover the entire house and its compounds. These live video streams can be sent from the Set top box to the user’s mobile handset. These applications can be made possible only with IMS integration. IMS helps in bringing voice/video and messaging services to IPTV in a standardized and seamless manner. It will not be wrong to say that “video” is the next killer application and a replacement for voice ! It will be interesting to invite feedback from visitors/regular readers of this blog on their thoughts on the Tispan IPTV over IMS architecture. — What are the hurdles for its widespread adoption? 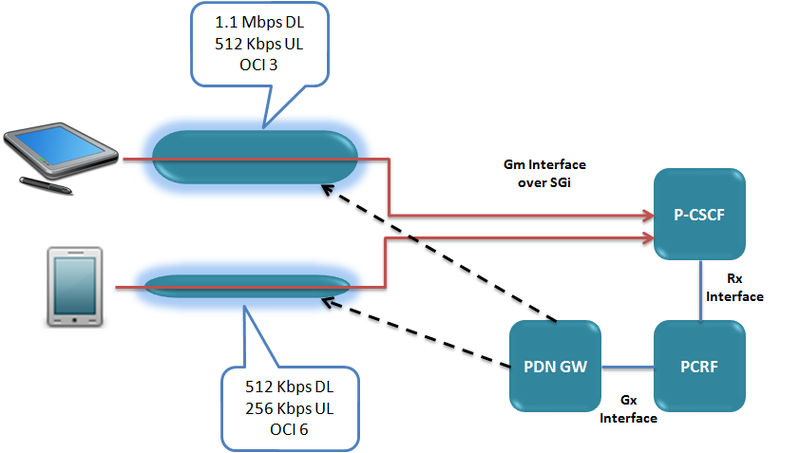 — How important is the acceptance of 3GPP MBMS in the adoption of IPTV over IMS ? — Will IPTV over IMS be a success only with LTE Advanced (where multicast is supported) ? — What about the devices ? — Will NGOSS act as an enabler for a smooth rollout of IPTV services? (No need for proprietary IPTV middleware). Your feedback is appreciated and invited.